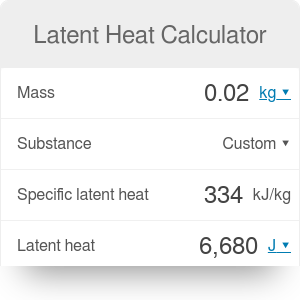 The Latent Heat Calculator helps you compute the energy released or absorbed during a phase transition like melting or vaporizing. In the text below we explain what is specific latent heat and present a simple latent heat calculation. Specific latent heat is energy hidden in the internal structure of a substance. For example, if we transfer heat to water, its temperature increases according to its specific heat. Once the temperature reaches the boiling point, something interesting happens. The temperature stops increasing and instead the water vaporizes. This process of turning water into vapor takes some energy. This is the latent heat. Once all the water is turned into vapor, a further transfer of heat will simply increase the temperature. Condensation is the reverse process to the vaporization where gas turns into liquid. The latent heat released during condensation is equal to the latent heat absorbed during vaporization. A change from a liquid to a gaseous phase is an example of a phase transition. Another common phase transition is from a solid to a liquid phase. Specific latent heat is the amount of energy absorbed or released during the phase transition per 1 kg of the substance. Q [J] is the heat absorbed or released depending on the direction of the transition. The specific latent heat is different for solid to liquid transition and liquid to gas transition. For example, if we want to turn 20 g of ice into water we need Q = 20 g * 334 kJ/kg = 6680 J of energy. To turn the same amount of water into vapor we need Q = 45294 J.
Computation of latent heat is simple with our calculator. It provides the specific latent heat for a few substances. If the substance that you're after is not on the list, just give the specific latent heat by filling in the appropriate field. It's amusing to observe that it takes less energy to go from solid state to liquid phase than to go from liquid phase to gas. It means that liquids are more like solids than gases. Latent Heat Calculator can be embedded on your website to enrich the content you wrote and make it easier for your visitors to understand your message.